The state of South Africa cities currently sits on a crossroad of possible futures, articulated in urban design, architecture, design, the arts and social studies. The dichotomies of formal and informal structures circulate and merge with boundaries that extend beyond the physical borders of supposedly defined urban spaces. In a night of discussion and exhibition dsgnTête-à-Tête, the flagship discussion platform of MoDILA and broadcast in partnership with Bush Radio 89.5FM every Thursday at 2:30 pm, hosts A Tale of [2+1] Cities, where renowned international experts in the fields of architecture and urban studies will debate with the public on their perspectives of local and global future cities. All designers and creatives are welcome! 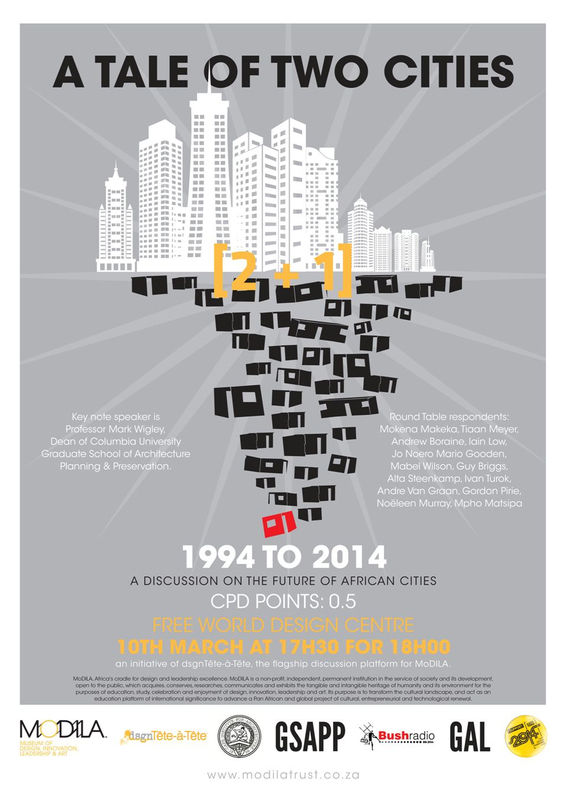 The discussion will be followed by an electronic exhibit of works from the Graduate School of Architecture Planning and Preservation, Columbia University, New York entitled Design intelligence Africa and from the University of Cape Town Architecture @ UCT – issues and themes at the Cape Institute for Architecture. The concept note will be provided subject to RSVP.